I have a confession to make. You know those burger places that serve burgers spread with peanut butter, jalapeno infused raspberry jam and bourbon bacon? They are all well and good and I applaud their creativity but when it comes down to it, that’s just too whacky of a burger for me. I mean, sure I would try a bite of someone’s but it’s just not something I would order. Let’s not tell anyone, I’d like to keep my food blogger name intact. My favorite burger is a simple bacon cheeseburger (loaded with pickles). Call me boring if you want. I prefer to think of myself as classic. While I was brainstorming some summer side dishes and salads to share with you. I kept going back to that classic burger. Originally, I was thinking what would be delicious paired with it to make a perfect, picnic worthy supper. But then I thought why can’t the burger become the side dish? 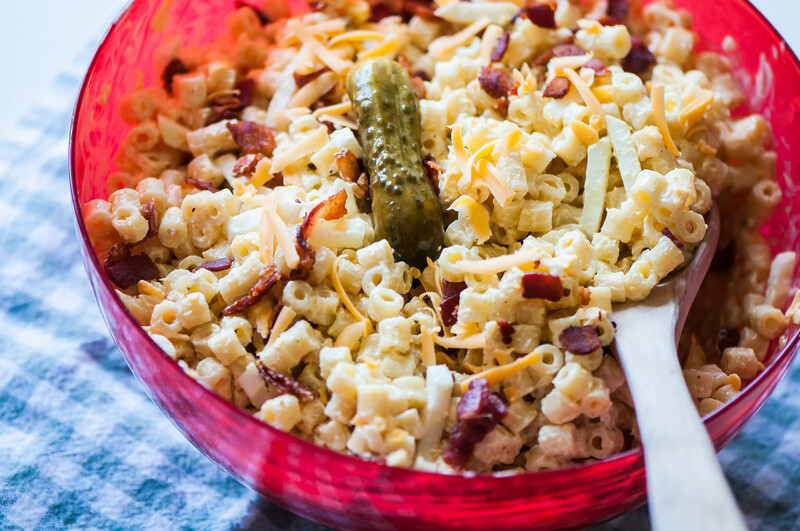 So, I took all my favorite flavors from a bacon cheeseburger (minus the beef) and combined it with macaroni salad for a new instant summer favorite, Bacon Cheeseburger Macaroni Salad. Fun noodles (because fun shaped noodles always taste better) are combined with a mustard heavy dressing, bacon, dill relish, shredded sharp cheddar and hard-boiled egg to bring all those cheeseburger flavors together. I like to get crazy sometimes with an egg on my burger so that’s where the addition of hard-boiled eggs comes in. I also think it isn’t macaroni salad without them. This salad is delicious eaten right away or after refrigerating for a few hours (to overnight). If you serve it right away, the tanginess from the relish and vinegar is much stronger then after it sits for a few hours to mellow out. Just a warning in case you have someone you are trying to trick with the pickle element. I would never, ever trick the people I love (ehem, Joel). No, I do love to trick my family into eating things they think they don’t like. Then there’s a big “in your face” moment after we’re all done eating and I tell them what was in whatever dish I pureed some “weird” vegetable into. The pickles here aren’t so easy to hide so if you truly don’t enjoy pickles, leave them out but don’t skip on the vinegar. It helps balance out the salad and isn’t strong tasting after it has sat for a few hours in the fridge. Cook pasta 1 minute less than directions on the box. Rinse thoroughly with cold water. In a large bowl, combine the mayo, mustard, vinegar, relish, salt, pepper, sugar and cheddar cheese. Add noodles and stir until fully combined. Gently fold in the bacon and hard-boiled eggs. *Click link in text for the perfect method for hard boiling eggs.